There are thousands of Plumbing & Pipe Restoration Companies out there, but what makes CuraFlo stand out is how CuraFlo is constantly trying new and better ways to improve your plumbing system and most importantly it’s durability. The CuraFlo commitment to staying out in front of the crowd had resulted in CuraFlo being the most complete selection of pipe restoration options in the industry. 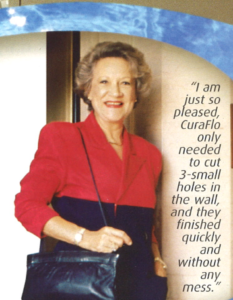 CuraFlo has been serving Canada and US for more than 20 years. With substantial experi ence in the industry, CuraFlo now provides a wide selection of solutions for pipe restoration, and with such a vast assortment of completed projects under our belt the CuraFlo Team are now experts in customer satisfaction. Plumbing restoration is highly intrusive work, however, years and years of working in care homes and hospitals have help fine tune the CuraFlo System and Team, minimizing impact on daily building operations and the lives of the residents. In North America, whenever leaks appeared in a plumbing system, pipe replacement is commonly the first thought that comes to mind. In Europe with a more mature pipe lining industry the first thought is “time to line the pipes”. CuraFlo’s Epoxy Lining Solution uses your existing pipes and builds a plastic pipe inside the existing pipes stopping corrosion in its tracks. This pipe restoration solution is cost effect and far less intrusive compared to repiping. No matter how worn the pipes in your place this may the longest, cost effective and least intrusive solution. CuraFlo also offers complete repipe service and often combines repipe and pipe lining on larger projects using the best solution for different area of the buildings plumbing system. If It’s your Sprinkler / Fire Suppression Pipes that are Failing? CuraFlo has you covered. CuraFlo has a pipe restoration solution to include your Fire Sprinkler Systems. These pipes can form pinhole leaks as well and CuraFloFS has you covered. Or is it your waste water pipes causing you so much trouble? Whether it’s your sewer or storm drains causing you grief they can be restored to better than new with CuraFlo CIPP, no cut, no dig, technology. If you’re the Proactive type and keen to head off plumbing troubles before they show up, CuraFloWT may be the perfect solution for you and your building(s). CuraFloWT, a Water Treatment System, with its advance technology is tailored to the specific water conditions in your area, slowing down and preventing further corrosion and pinhole leak. Taking water treatment one step further, CuraFlo often combines water treatment with repipe or pipe lining targeting the most corroded pipes in the building for upgrading. While new Water Treatment can slow and or even prevent corrosion from the whole system, adding decades or extra life to the plumbing system for a fraction of the cost of repipe. Contact a CuraFlo expert today to find the perfect solution for your home or buildings pipe troubles.